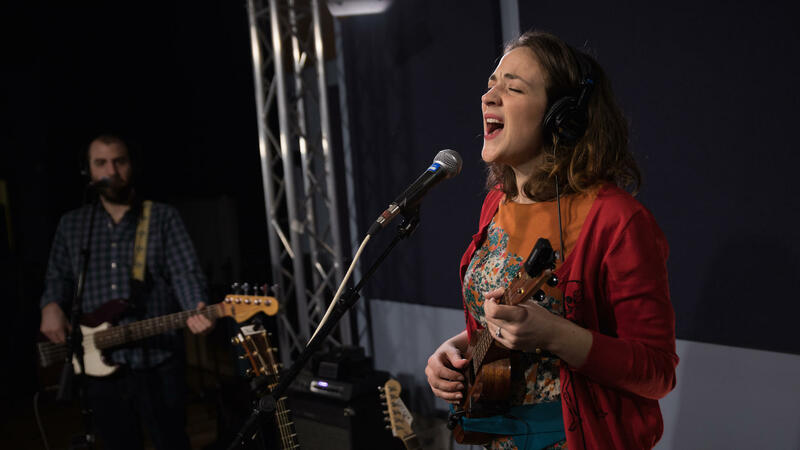 Becca Stevens performs in the World Cafe studio at WXPN in Philadelphia, Penn. We first met Becca Stevens when she sang a show-stopping solo vocal line on a cover of Joni Mitchell's "Woodstock" during a World Cafe session with David Crosby. She was part of Crosby's young, Brooklynite backing band, and we were thrilled to learn that they also write songs together. She helped co-write some of his latest record and, in return, he co-wrote a song for her brand-new album, Regina. Regina is inspired by Queens of all kinds — the historical, the mythological, the personal and even the one led by Freddie Mercury. The album sews together many of Stevens' musical loves, from crunchy jazz chords and intricate harmonies to Appalachian folk, world music and R&B. Regina also reflects Stevens' eclectic and growing list of collaborators: In addition to her work in Crosby's backing band, she has worked with contemporary greats like pianist Brad Mehldau, jazz wonder Esperanza Spalding and big-band ensemble Snarky Puppy. In this session, Stevens performs songs from Regina, including the one she co-wrote with Crosby. She shares what it was like to work with the Croz, the story of the time her music woke him from an in-studio nap and how an early interest in Queen Elizabeth turned into an entire album about queens.